Central giant cell granuloma (CGCG) of the jaw is a relatively rare, central, osteolytic disease that in a younger individual exhibits aggressive behavior. The disease process is considered to be idiopathic, nonneoplastic, proliferative intraosseous lesion consisting of cellular fibrous tissue that contains multiple foci of hemorrhage, aggregations of multinucleated giant cells, and occasionally trabeculae of woven bone. The lesion is characterized by rapidly enlarging swelling with bony expansion and tooth displacement. Early cortical perforation also has been reported., The recent World Health Organization in its recent classification of histological classification of odontogenic and maxillofacial bone tumors (4th edition, 2017) has delineated under the giant cell lesions and bone cysts. The aim of this report is to present a case of CGCG in an adult patient and its treatment challenge. A 33-year-old male patient presented to the author's center with a localized swelling on the left upper jaw of his face for 6 months. The swelling, as per the patient, was insidious in onset, gradually progressive, with mild, progressive nasal obstruction, loosening of associated teeth. There was no history of any discharge or difficulty in chewing or swallowing. Other medical history was noncontributory. External examination revealed a diffuse swelling on the left side of his maxilla obliterating the left nasolabial fold and mild facial asymmetry. The overlying skin was normal and nontender, and there was no associated lymphadenopathy. The intraoral examination revealed an intact permanent dentition in place, a swelling in the left upper alveolus associated with canine and premolars sparing the gingivobuccal sulcus, and a faint bulge on the left side of hard palate. The left first premolar appeared to be drifting toward the distal aspect. On palpation, the surface was smooth without remarkable fluctuation and had faint bony crepitus in both the buccal and palatal aspects. An orthopantomogram (OPG) and a computed tomography (CT) were acquired. The coronal and axial sections and three-dimensional reconstructions were performed. In the OPG, the lesion appeared to have a multilocular radiolucency with well-defined at certain areas and ill-defined margins at other areas. CT and OPG of the left maxillary region along the canine revealed an expansile, mainly cystic multilocular lesion, 21 mm x 21.6 mm x 11.6 mm in maximum dimension that had lead to thinning and erosion of the bone along the cystic walls in several areas. A soft-tissue shadow was observed in the maxillary sinus of 13.9 mm × 15.6 mm at maximum dimension. Anterosuperiorly, the lesion was bulging into the maxillary sinus. Laterally, the lesion was well-circumscribed to the region between canine and molars. Inferiorly, there was an erosion of the left maxillary arch with projection of canine and both premolars into the cystic component. There was significant root resorption in the premolars and the cystic lining was in direct contact with the canine [Figure 1], [Figure 2], [Figure 3]. The biochemical and hematological investigations of the patient were all within normal limits. Ancillary tests revealed normal levels of serum calcium, phosphorus, and alkaline phosphatase. Based on the clinical and radiological presentation, a provisional diagnosis of an odontogenic cyst was made. Differential diagnosis included radicular cysts, maxillary mucocele, giant cell tumor, radicular cyst, adenomatoid odontogenic tumor, and unicystic ameloblastoma. An incisional biopsy was performed through the buccal cortical perforation. Intraoperatively, a well-defined bilobed mass of about 2 cm × 2 cm was carefully dissected out in toto. Histopathological examination revealed normal cortical bone with a normal inflamed cellular stroma with patchy distribution of multinucleated giant cells suggestive of giant cell granuloma. Based on the clinical, radiological, and histopathological findings, a diagnosis of CGCG was made. As the involved bone had multiple cortical erosions, involving the buccal, palatal, and sinus walls as well as associated tooth resorption, a radical removal of the lesion was planned. After raising the flap, under general lesion, the margins were visualized and marked. The lesion along with the palatal surface was removed in total from the maxillary left lateral incisor to the first molar. The surgical defect was closed with harvested bone graft and drain placed. The area was thoroughly debrided hemostasis achieved and closed in layers with resorbable sutures. Appropriate antibiotics (injection Taxim – 1 mg and injection Metrogyl – 500 mg for 5 days), painkillers (tablet Diclomol), and dietary instructions provided. The resected portion of the jaw was subjected to histopathological examination that confirmed clinical diagnosis as well as marginal clearance. The lesion healed well during postoperative period, and the patient remained asymptomatic at 1-year follow-up [Figure 4]. CGCG as an entity was first described in 1953 as a benign lytic lesion that usually occurs in the jaw bones. Since then, several cases have been reported from India.,,, In pertinent contemporary Indian biomedical literature, CGCG involved children whereas the present case was an adult male. The left-side and maxillary occurrence was consistent with previous reports. The radiological profile of our case was consistent with the findings from a large series of cases reported till date. Several nonsurgical treatment options have been described for the treatment of CGCG of the jaws including intralesional steroids, subcutaneous or nasal calcitonin, subcutaneous injections of alpha-interferon, and a protein tyrosine kinase inhibitor imatinib. However, a decade old Cochrane review has indicated that there is an absence of sufficient evidence to pinpoint the efficacy of these methods. The recurrence rate postsurgery is described to be 13%–22% within a short postoperative period. Curettage is the advised treatment for small lesions, but this carries the risk of recurrence. Radical excision is the treatment of choice when the lesion is extensive and involves the cortex, but this would result in loss of multiple teeth as is seen in the present case. Sacrificing teeth instead of performing root canal serve two purposes – (1) the involved teeth exhibit radiological evidence of involvement and resorption and (2) If Root Canal Treatment is performed, the healing of the surgical defect would be impeded. Hence, in unfavorable situation, the removal of teeth may be required. In our present case, surgery was preferred over conservative treatment because of the cancellous anatomic location that is associated with maxillary sinus and other vital organs, relatively large size of lesion, aggressive clinical course, thinning out of cortical plates, and involvement of maxillary sinus. This impelled out decision to perform surgical resection and primary reconstruction with autogenous bone graft. The result of the surgery was successful. 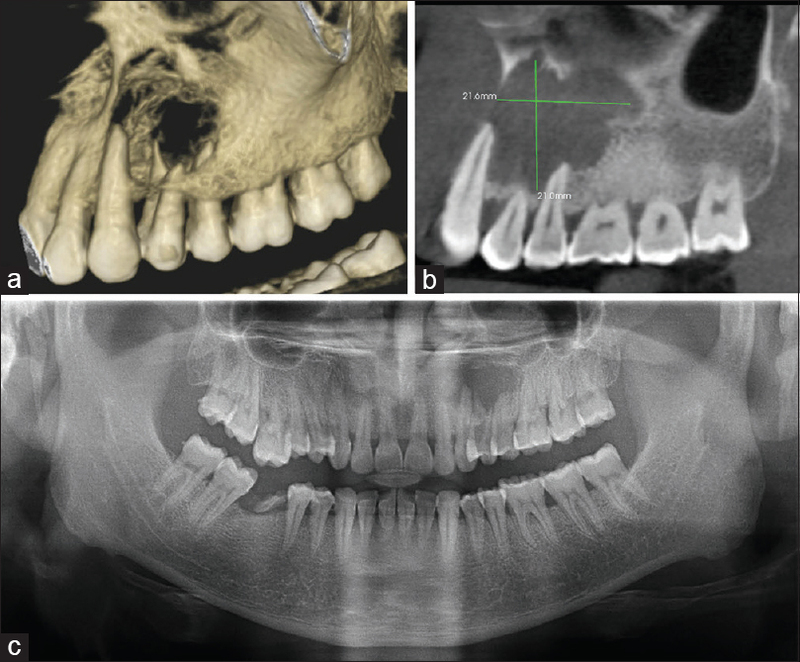 The successful management of a rare maxillofacial lesion in a young adult is reported. The management choices and diagnostic algorithm in maxillary segment have been discussed. Buduru K, Podduturi SR, Vankudoth DS, Prakash J. 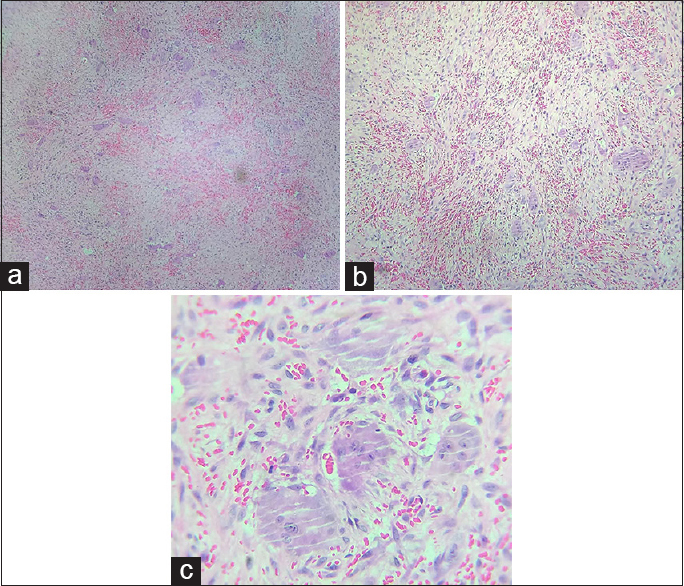 Central giant cell granuloma: A case report and review. J Indian Acad Oral Med Radiol 2017;29:145-8. Gupta M, Gupta M, Singh S, Kaur R. Central giant cell granuloma of the maxilla. BMJ Case Rep 2013;2013. pii: bcr2013009102. Available from: http://www.screening.iarc.fr/atlasoralclassifwho2.php. [Last accessed on 2018 Nov 30]. Devi CP, Swaroopkanth T, Sudhakar G, Kiranmai D, Sasank R, Sridharreddy D. Central giant cell granuloma of maxilla: A case report. Indian J Otolaryngol Head Neck Surg 2013;65 Suppl 1:192-4. Sholapurkar AA, Pai KM, Ahsan A. Central giant cell granuloma of the anterior maxilla. Indian J Dent Res 2008;19:78-82. Stavropoulos F, Katz J. Central giant cell granulomas: A systematic review of the radiographic characteristics with the addition of 20 new cases. Dentomaxillofac Radiol 2002;31:213-7. Suárez-Roa Mde L, Reveiz L, Ruíz-Godoy Rivera LM, Asbun-Bojalil J, Dávila-Serapio JE, Menjívar-Rubio AH, et al. 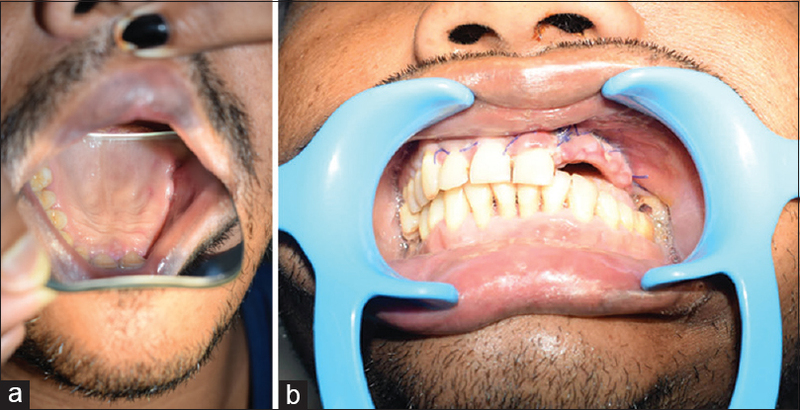 Interventions for central giant cell granuloma (CGCG) of the jaws. Cochrane Database Syst Rev 2009;4:CD007404. doi: 10.1002/14651858.CD007404.pub2.